Welcome HtPBLaM fans from the video yesterday. For today, I decided I’d do something a bit HtPBLaM themed since HtPBLaM did something Pirates versus Ninja themed. So, for today, we’re doing Captain Falcon. This may not be the quintessential Captain Falcon. It’s hard to live up to his internet God status, but we’re aiming for something that can be played in a high level campaign. So, this isn’t perfect, but it’s good enough to play. Born in the Saddle (Passive): +2 to Ride Checks. Quick Side-swipe (Cost 1): Do Ride’s Body Score in Damage (The Blue Falcon has an 8). Perfect Momentum (Cost 2): +1 to hit as long as you hit last round. The Ghost in the Machine (Passive): Can use non-animal rides. Twitch Reflexes (Passive): +1 to Reaction. Drive By! (Cost 6): 5 damage to everyone in a square the Equinja moves through. Call Your Shots (Passive): +1 to hit if you call out your attack names. Hit the Nitro! (Passive): Move abilities can be used with Rides. Rev Your Engines (Cost 3): Triple Move this turn if in a straight line. The Blue Falcon: 30 Move Speed. -2 to Drive Checks. Flaws: Code (1): Justice, Extreme Honor (2), Addiction (2): Speed, Reckless (2), Focused Attribute (2): Body; Resistance, True Falcon Punch (5): Knocks Self Out for a Day with Crit on Raging Digit. Kills self with Death duel. 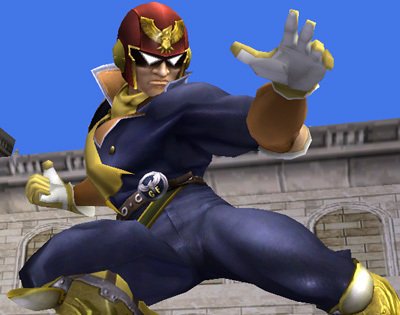 Description: Captain Falcon is a beast, even by 150 points character standards. Over half his points are spent on attribute scores. He’s got crazy Life and can actually dodge. He can belt out 5 Raging Digits that do 75 damage each before knocking himself out (this is your Falcon Punch). He can Equinja kick for a significantly less, but more efficiently 21 damage (Falcon Kick). And on top of that, he can ride his F-zero Racecar to insane speeds and use it to attack. Also, he has wear the scarf, which allows him to pull some amazing feats. His only weak spot is his slightly below average precision. However, his +1 to hit from calling his shots plus his Perfect Momentum should allow him to do some real damage to all but the most dodgey characters. So what did you think? Pretty good approximation or not accurate at all. Leave your comments below on this Well-Loved Hero Wednesday or leave a suggestion for next weeks Well-Loved Hero. See you next week. This entry was posted in Well-loved Hero Wednesday and tagged Blue Falcon, Captain Falcon, Falcon, High Point, How to Play Brawl Like a Man, HtPBLaM, Kick, Powerful, Punch, Well-loved Hero Wednesday. Bookmark the permalink.